Ashley Elisabeth Wagner (born May 16, 1991) is an American figure skater. She is the 2016 World silver medalist, a 2014 Olympic bronze medalist in the figure skating team event, the 2012 Four Continents champion, a three-time Grand Prix Final medalist, winner of five Grand Prix events (2012 and 2016 Skate America; 2012 and 2013 Trophée Éric Bompard; 2015 Skate Canada), and a three-time U.S. national champion (2012, 2013, and 2015). Ashley Wagner is the first child and only daughter of Lieutenant Colonel Eric Wagner, U.S. Army (retired) and Melissa James, a former schoolteacher. Wagner was born on a U.S. Army Base in Heidelberg, Germany, where her father was stationed at the time. Her younger brother was a skater and competed on the national level. Because Wagner's father was in the military, her family moved nine times during her childhood; they settled in northern Virginia when she was ten years old. Besides Germany, she has lived in Delaware, California, Alaska, Kansas, Washington State, and Virginia. Wagner currently lives in southern California but considers Seabeck, Washington her home. Wagner was home schooled by her mother for seven months. She later attended West Potomac High School through the 2007/2008 school year. After studying at Northern Virginia Community College via its online Extended Learning Institute, she enrolled in Saddleback College in California but has not graduated. She speaks a little German in addition to English. According to an interview, Wagner has suffered several concussions and she believes these incidents had affected her cognitive abilities. Wagner has her own YouTube channel. She is also an avid user of Twitter, Myspace, Instagram and Facebook. She is beginning a new venture of becoming a social media influencer. Wagner began skating at age five in Eagle River, Alaska. She says that her mother told her she could choose between ballet or figure skating, but she "wasn't going to do anything in pink shoes." According to her mother, Wagner began to show promise early and won a gold medal at her first competition. In 1998, Wagner watched Tara Lipinski win the gold medal at the 1998 Winter Olympics in Nagano, Japan on television. From that moment, she decided that she wanted to compete in the Olympics too. Wagner later trained in Kansas City and Tacoma, Washington until her family moved to Portland, Oregon, where she was taught by Tonya Harding's former coach, Dody Teachman. In January 2002, Wagner began training with Shirley Hughes in Alexandria, Virginia. Jill Shipstad-Thomas choreographed her competitive programs. In the 2002–03 season, Wagner qualified for the U.S. Junior Figure Skating Championships, which are the national championships of the United States for figure skaters at the juvenile and intermediate levels. Wagner placed 17th at the Intermediate level. The following season she tested up to the novice level. She won the silver medal at her regional competition, the first step to qualifying for the national championships, but placed 10th at her sectional competition and did not qualify for the 2004 National Championships. Wagner qualified for her first U.S. Championships in the 2004–05 season after placing first at both the Northwest Pacific Regionals and the Pacific Coast Sectionals. Competing on the novice level, she placed seventh at Nationals. For the 2005–06 season, Wagner moved up to the junior level. She won both the Northwest Pacific Regional and Pacific Coast Sectional competitions again to qualify for the National Championships. At the 2006 U.S. Nationals in St. Louis, Missouri, Wagner finished fourth on the junior level, earning the pewter medal. After the event, Wagner was named to the U.S. team for the Triglav Trophy in Slovenia, her first major international competition and where she made her international junior debut. There she landed six triple jumps, including a triple toe-triple toe combination, in her long program to move up from third in the short program to first overall. In the 2006–07 season, Wagner made her Junior Grand Prix debut. She won both the Junior Grand Prix event in Courchevel, France, and the event in The Hague, Netherlands. Her wins qualified her for the Junior Grand Prix Final in Sofia, Bulgaria, where she won the silver medal behind fellow American Caroline Zhang, with a final score of 142.01. At the 2007 U.S. Nationals in Spokane, Washington, Wagner placed third behind Mirai Nagasu and Caroline Zhang, earning herself a spot on the World Junior Championships team. Her bronze medal at the 2007 Nationals was the first time she had placed in the top three at the national championships. At the 2007 Junior Worlds in Oberstdorf, Germany, she landed seven triple jumps in her long program. She finished with the bronze medal behind Zhang and Nagasu, completing the first-ever American sweep of the World Junior podium. Wagner moved up to the senior level both nationally and internationally for the 2007–08 season. She made her senior international debut at the 2007 Skate Canada International in Quebec City, Quebec, where she placed fifth overall. Two weeks later, Wagner won her first senior international medal at the 2007 Trophée Éric Bompard in Paris, France. She placed third behind reigning World silver medalist Mao Asada and reigning U.S. National Champion Kimmie Meissner. She finished second in the long program ahead of Meissner and only lost to Meissner in the final standings by 0.11 points. During her fall Grand Prix events, Wagner attempted the triple Lutz-triple loop combination for the first time in competition, but it was downgraded by the technical callers because her attempts were not fully rotated. Discussing her first year on the Grand Prix, Wagner said, "Competing on the Grand Prix has forced my skating to mature. I'm a senior lady now, and I need to perform like one." In January 2008, Wagner competed on the senior level for the first time at the 2008 U.S. Nationals in St. Paul, Minnesota. She placed second in the short program behind Mirai Nagasu after landing a triple Lutz-triple loop combination. In the free skate, she placed second again, this time behind Rachael Flatt, after landing seven triples including another triple Lutz-triple loop combination. She finished with the bronze medal overall behind Nagasu and Flatt. Because Nagasu, Flatt, and pewter-medalist Caroline Zhang were too young to compete at an ISU Senior Championship event, Wagner was the only medal winner to be named to the Four Continents and World Championships teams. Because of her third-place finish at the 2008 Nationals, Wagner earned a bye to the 2009 U.S. Nationals. At the 2008 Four Continents in Goyang, South Korea, Wagner finished twelfth in the short program, fifth in the free skate, and eighth overall. At the 2008 World Championships in Goteburg, Sweden, she finished 16th after placing 11th in the short program and 15th in the long program. She fell once in her free skate. In June 2008, Wagner announced that she would be leaving her longtime coach Shirley Hughes to begin working with Priscilla Hill in Wilmington, Delaware. Wagner won the bronze medal at the 2009 NHK Trophy. For the 2008–09 Grand Prix of figure skating season, Wagner was assigned to compete at 2008 Cup of China where she finished fourth. Her next event was the 2008 NHK Trophy, where she again finished fourth. In the process she set new personal bests in the short program and her combined score. She won the pewter medal at the 2009 U.S. Nationals and represented the United States at the 2009 Junior Worlds in Sofia, Bulgaria where she placed third, winning her second junior world medal. For the 2009–10 Grand Prix season, Wagner was assigned to compete at the 2009 Rostelecom Cup, at that event she won the silver medal. In the process she set new personal best scores in her long program and her combined score. After winning the bronze medal at the 2009 NHK Trophy, she qualified for the Grand Prix Final. At the Final, Wagner ranked last in the short program, fourth in the free skate, and fourth overall. At the 2010 U.S. Nationals, Wagner won her second bronze medal. She was placed on the team to the 2010 Junior Worlds, but withdrew from the team before the event. A racing heartbeat which had long bothered Wagner became more frequent during the summer before the 2010–11 season. She also began to suffer violent full-body muscle spasms which her coach Priscilla Hill said were "some of the most horrific things I've ever seen." She saw a number of physicians who were unable to determine the cause. Finally, chiropractor and muscle specialist Steve Mathews revealed that tension in her neck muscles was causing one of her vertebrae to be pushed out of place, squeezing various nerves; a physical therapy program reduced the problems. Wagner had practiced her new long program only about six times before she competed at 2010 NHK Trophy where she finished 5th. At 2010 Cup of Russia she won the bronze medal. In June 2011, Wagner announced that she would move to Aliso Viejo, California to train with John Nicks and Phillip Mills at the Aliso Viejo Ice Palace. She quit her part-time job at a jeans store and used some of the money she had been saving for college to move across the country. Wagner performs her free program at the 2012 Worlds. Wagner began the 2011–12 season at the 2011 Skate Canada International. She placed second in the short program and third in the freeskate to win the bronze medal overall. At the 2011 NHK Trophy, Wagner placed fifth in the short program and third in the freeskate to finish 4th overall. At the 2012 U.S. Nationals, she ranked third in the short program. She was first in the free program and won her first national title. After her U.S. Championship win, Wagner was assigned to both the 2012 Four Continents Championships and the 2012 World Championships. At Four Continents, she placed second in the short program after two-footing a planned triple flip-triple toe combination and successfully landing her triple loop and double axel. She placed first in a free skate which included six triples and won the gold medal ahead of two time world champion Mao Asada. Her scores at the Four Continents event were the highest overall for a world lady all season and her free program score was the second highest of the season behind Carolina Kostner's gold medal winning free skate at the 2012 World Championships. At the World Championships, Wagner was eighth in the short program after stepping out of her triple flip. She placed third in the free skate with a seven triple program, and 4th overall, thus securing two spots for U.S. ladies at the 2013 Worlds. At her first Grand Prix assignment of the season, the 2012 Skate America, Wagner placed first in both programs and won her first gold on the GP series. At the 2012 Trophée Éric Bompard, she was second in the short and first in the long and won her second GP title, qualifying for the 2012 Grand Prix Final. In a November 2012 interview, Wagner said, "Nicks changed my technique a little bit but not a ton. [...] The mental aspect of my training is where he really has helped me because confidence leads to consistency under pressure." At the Grand Prix Final in December, Wagner placed second in the short. A pair of hard falls during the free skate injured her left hip (hip pointer) and bruised her right knee but she was able to complete the program and finished fourth in the segment. In the overall standings, she finished with the silver medal, just ahead of Japan's Akiko Suzuki. At the 2013 U.S. Championships, Wagner placed first in the short program, second in the free skate after falling twice and two-footing her salchow jump, and was able to edge out Gracie Gold to win her second straight national title. She was the first U.S. ladies' single skater to win consecutive national titles since Michelle Kwan in 2005. Wagner's luggage with her skates was lost on her way to the 2013 World Championships but arrived before the evening practice on March 12. She placed fifth at Worlds, while her teammate, Gracie Gold, placed sixth. With these placements, they gained three spots for the Olympics and World Championships. Wagner placed second at the 2013 World Team Trophy and the United States won the event. One week later, Phillip Mills, her choreographer, announced that he had given Wagner his resignation. On April 24, John Nicks said he would no longer travel but would still coach Wagner at the Aliso Viejo Ice Palace. On June 25, Wagner said she would also train in Lake Arrowhead, California with Rafael Arutyunyan, who would accompany her to competitions. In the 2013–14 ISU Grand Prix season, Wagner won silver at her first event, the 2013 Skate America. Her next assignment was the 2013 Trophée Éric Bompard where she won gold and qualified for the 2013–14 Grand Prix Final in Fukuoka, Japan. Wagner won bronze at the final behind Yulia Lipnitskaya after placing third in both segments. After both a short program where she finished 4th, falling twice, and only landing four triples during the free program, Wagner finished fourth at the 2014 U.S. Championships. She was named to the U.S. team for the 2014 Winter Olympics in Sochi, Russia, despite finishing behind 3rd place Mirai Nagasu, due to her strong international record, which is considered under the selection criteria. Following the U.S. Championships, she also announced her return to her Samson and Delilah free program. She won a team bronze medal at the Olympics. She continued on to compete at the 2014 World Figure Skating Championships in Saitama, Japan, where she placed seventh in the short program, fourth in the free skate, and finished in seventh place overall. For the 2014–15 season, Wagner was assigned to the 2014 Skate Canada and the 2014 Trophée Éric Bompard. After winning silver at Skate Canada behind Russia's Anna Pogorilaya and bronze at Trophée Bompard behind Russia's Elena Radionova and Yulia Lipnitskaya, she qualified in the last spot for the Grand Prix Final in Barcelona. Wagner is the first American woman since Michelle Kwan to qualify for three consecutive Grand Prix Finals. At the Grand Prix Final, Wagner placed sixth in the short program and third in the long program to win the bronze medal behind Russians Elizaveta Tuktamysheva and Radionova. The bronze is Wagner's third consecutive Grand Prix Final medal. At the 2015 U.S. Championships, Wagner won both the short program and free skate, setting a new U.S. record score of 221.02. Since Michelle Kwan in 1999, Wagner is the first U.S. senior ladies figure skater to win three national championships. At the 2015 World Championships in Shanghai, Wagner placed 11th in the short program, third in the free skate, and 5th overall. At the 2015 World Team Trophy, she ranked fourth in both segments and Team USA won the event. Wagner's two Grand Prix assignments for the 2015–16 season were 2015 Skate Canada International and 2015 NHK Trophy. She began her season by winning the gold medal at Skate Canada. She then went onto placing 4th at the NHK Trophy. Those results qualified her for the 2015–16 Grand Prix Final. At the Final she placed 6th in the short program, third in the free skate, and 4th place overall. At the 2016 U.S. Championships, Wagner was awarded the bronze medal behind Gracie Gold and Polina Edmunds. Wagner competed at the 2016 World Championships in Boston. She placed fourth in the short with a personal best score of 73.16. She then competed as the last skater in the free skate, placing second by scoring another personal best of 142.23, the highest free program score ever recorded by an American woman. Her performances earned her the silver medal, becoming the first American woman to win a medal at the World Championships in a decade. Wagner finished her season by competing for Team North America at the inaugural 2016 KOSÉ Team Challenge Cup. Her performances greatly contributed to the team earning the gold medal. In August 2016, Wagner spent three days working with Charyl Brusch on her spins, saying, "She just kind of stripped everything down and had me go back to basics. [...] I plan on going back later this season and building on that." Wagner began her Grand Prix season at 2016 Skate America, where she became the first American woman since Michelle Kwan to regain a Skate America title. At the 2016 Cup of China, a poor free skate led Wagner to her worst Grand Prix finish in her career as she finished just outside of the top 5, placing 5th in the short program, 7th in the free skate and 6th overall. While she subsequently did not qualify for the 2016-2017 Grand Prix Final, Wagner quickly rebounded with her first silver medal at the 2017 U.S. Championships behind Karen Chen. She placed third in the short program and 2nd in the free skate to finish 2nd overall. At the 2017 World Championships in Helsinki, Wagner scored a 69.04 in the short program, placing seventh. In a somewhat lackluster free program, she scored a 124.50, placing tenth in the free program and seventh overall with a score of 193.54. Wagner's placement, combined with a fourth-place finish from USA's Karen Chen, qualified Team USA three spots for the 2018 Olympics and 2018 World Figure Skating Championships. Wagner finished her season at the 2017 World Team Trophy, where her performances greatly contributed to Team USA winning the bronze medal. Wagner revealed her music choices early for the 2017-18 Olympic season, announcing La La Land for her free skate. However, she went to back to her Moulin Rouge! program in the summer before competition. Wagner began her Grand Prix season at 2017 Skate Canada International, where she won the bronze medal after placing 7th in the short program and 4th in the free skate. Wagner withdrew from her second Grand Prix event at 2017 Skate America in the middle of her free skate due to an ankle infection. Several days later, she revealed that she would return to her La La Land long program. After placing 4th at the U.S. Figure Skating Championships, Wagner was named as the first alternate for the 2018 Winter Olympic team and the 2018 World Figure Skating Championship team. She was selected to compete at the 2018 Four Continents Figure Skating Championships, but opted to withdraw, giving her spot to alternate Angela Wang. Wagner was eventually invited to compete at the 2018 World Figure Skating Championships due to Karen Chen's withdrawal, but declined. Mariah Bell was selected as the replacement. As of January 2019, Wagner is taking a break from figure skating, and has moved to Boston, Massachusetts. Unlike most skaters, Wagner spins and jumps clockwise. She has executed multiple triple-triple jump combinations in international competition, including the 3F-3T, 3Lz-3T, and 3Lo-1Lo-3S. She landed the 3Lz-3Lo combination at the 2008 U.S. Nationals. Her signature elements include a Charlotte spiral and a bent-leg layover camel spin with both arms outstretched above her head. She dislikes spins. In November 2012, Nike began sponsoring Wagner. In December, she became one of Pandora Jewelry's style ambassadors. In October 2013, Wagner was named as a face of CoverGirl. Wagner performs her free skate at the 2012–13 Grand Prix Final. Wagner performs her short program at the 2012–13 Grand Prix Final. Wagner performs her exhibition Fever at the 2008 NHK Trophy. Small medals for short and free programs awarded only at ISU Championships. Pewter medals for fourth-place finishes awarded only at U.S. national and regional events. At team events, medals awarded for team results only. Small medals for short and free programs awarded only at ISU Championships. Pewter medals for fourth-place finishes awarded only at U.S. national and regional events. ^ Wagner, Ashley [@AshWagner2010] (July 8, 2014). "@middlenamegame Elisabeth!" (Tweet) – via Twitter. ^ a b c Walker, Elvin (September 20, 2008). "Wagner Takes New Approach to Stay at the Top". Golden Skate. ^ Skaters answer trivia questions about each other. IceNetwork. June 2, 2017. Event occurs at 2:02. ^ a b Clarke, Liz (January 31, 2014). "I'm in this to be remembered". Washington Post. ^ Borzilleri, Meri-Jo (January 20, 2010). "She Lives in Virginia and Trains in Delaware, but Calls Seabeck Home". Kitsap Sun. Archived from the original on February 15, 2012. ^ a b c Glod, Maria (January 20, 2005). "A 'Normal' Prodigy: For Ashley Wagner, It's Important To Coordinate Ice Time, Family Time". Washington Post. Retrieved July 28, 2009. ^ a b c d Mittan, Barry (December 3, 2007). "What a Year for Wagner". Skate Today. ^ a b c Rosewater, Amy (June 12, 2006). "Ashley Wagner Finds a Home and Success in Alexandria". U.S. Figure Skating. Retrieved July 28, 2009. ^ a b c Rutherford, Lynn (January 18, 2008). "Wagner ready to step up: Teen from Virginia wants her turn in the spotlight". Icenetwork.com. Retrieved July 28, 2009. ^ Ford, Bonnie D. (March 28, 2016). "Roundtable: Concussions a concern in non-contact sports". ESPN. ^ Almond, Elliott (January 19, 2017). "Ice skating and concussions: Ashley Wagner lived in 'silent terror' after head injury". Mercury News. Archived from the original on January 20, 2017. ^ a b "Wagner leaves coach Hughes for Hill". Icenetwork.com. June 23, 2008. Retrieved July 28, 2009. ^ a b c d Rosewater, Amy (June 14, 2011). "Wagner goes West in search of gold medals". IceNetwork. Retrieved June 14, 2011. ^ Zanca, Sal (March 3, 2007). "American Ladies Sweep World Junior Medals". U.S. Figure Skating. Retrieved July 28, 2009. ^ Rutherford, Lynn (January 24, 2008). "Fourteen-year-old Nagasu leads after stunning short: Top three ladies all nail triple-triples". Icenetwork.com. Retrieved July 28, 2009. ^ Shipley, Amy (January 26, 2008). "Alexandria's Wagner Is Unfazed by Success". Washington Post. Retrieved July 28, 2009. ^ Rutherford, Lynn (January 27, 2008). "Nagasu hangs on for ladies national title: Flatt wins free skate, silver; Wagner takes bronze". Icenetwork.com. Retrieved July 28, 2009. ^ Flade, Tatiana (February 16, 2008). "Mao Asada bests field for top spot: Rochette takes second, Ando third". Icenetwork.com. Retrieved July 28, 2009. ^ "Japanese Women Rule Four Continents Event". Washington Post. February 17, 2008. Retrieved July 28, 2009. ^ Stevenson, Alexandra (March 20, 2008). "Asada wins ladies crown at worlds: Number one woman in the world takes home gold". Icenetwork.com. Retrieved July 28, 2009. ^ "Lysacek, Belbin and Agosto to Skip 2010 World Championships". U.S. Figure Skating. February 27, 2010. Archived from the original on March 3, 2010. ^ a b c Shipley, Amy (January 26, 2011). "Ashley Wagner back on the ice after year of 'absolute insanity'". Washington Post. Archived from the original on January 30, 2012. ^ "Ashley Wagner Announces Coaching Change". U.S. Figure Skating. June 14, 2011. Retrieved June 14, 2011. ^ Rosen, Karen (March 14, 2012). "Ashley Wagner's rocky road to the top". TeamUSA.org. ^ Hersh, Philip (March 24, 2012). "Wagner coming into her own on her own". Chicago Tribune. ^ Walker, Elvin (January 29, 2012). "Wagner rebounds to gold at U.S. Nationals". Golden Skate. ^ Walker, Elvin (February 12, 2012). "Wagner captures 4CC title". Golden Skate. ^ Walker, Elvin (October 22, 2012). "Wagner commands first grand prix title at Skate America". Golden Skate. ^ Flade, Tatjana (November 18, 2012). "Wagner wins second consecutive Grand Prix gold in Paris". Golden Skate. ^ Whiteside, Kelly (November 20, 2012). "Ashley Wagner finds strength under pressure, consistency". USA Today. ^ Hersh, Philip (December 8, 2012). "Two falls, second place for Wagner in Grand Prix Final". Chicago Tribune. ^ Walker, Elvin (January 27, 2013). "Wagner defends US ladies title in Omaha". Golden Skate. ^ Whiteside, Kelly (March 12, 2013). "Ashley Wagner tries to relax after her skates are lost". USA Today. ^ "ISU Wprld Figure Skating Championships 2013 - Ladies Result". International Skating Union. March 16, 2013. ^ Hersh, Philip (April 15, 2013). "Given the sports news of the day, this is of minor consequence, but here is how choreographer Phillip Mills explained his split from @ashwagner10" (TwitLonger). ^ Rosewater, Amy (April 25, 2013). "Wagner adjusts after Nicks puts traveling aside". IceNetwork. ^ Whiteside, Kelly (April 25, 2013). "Ashley Wagner seeks new coach to work with her on road". USA Today. ^ "Ashley Wagner Announces Coaching Team". U.S. Figure Skating. June 25, 2013. 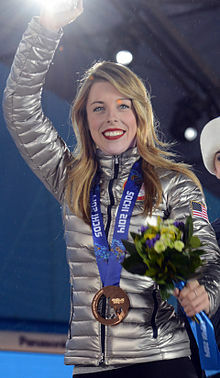 ^ "West Potomac grad Ashley Wagner falls twice, finishes fourth; Olympic spot in jeopardy". Washington Post. January 11, 2014. ^ Whiteside, Kelly (January 12, 2014). "Ashley Wagner makes Olympic team despite placing fourth". USA Today. Boston. ^ Armour, Nancy (January 21, 2014). "Ashley Wagner changes long program 3 weeks before Sochi". USA Today. ^ Slater, Paula (December 9, 2014). "Ashley Wagner: 'Russian girls are incredible'". Golden Skate. ^ Zaccardi, Nick (November 29, 2014). "Gracie Gold wins NHK Trophy; Grand Prix Final picture". NBC Sports. ^ a b Slater, Paula (January 26, 2015). "Wagner still hungry to learn and improve". Golden Skate. ^ Brennan, Christine (January 25, 2015). "Ashley Wagner makes powerful statement in 3rd U.S. title". USA Today. ^ "ISU Grand Prix of Figure Skating 2015/16- Ladies" (PDF). International Skating Union. Archived from the original (PDF) on July 2, 2015. Retrieved June 16, 2015. ^ Samuels, Robert (April 3, 2016). "Ashley Wagner ends American figure skating medal drought with silver at worlds". The Washington Post. Retrieved April 3, 2016. ^ a b c Rutherford, Lynn (August 25, 2016). "Wagner, Gold hit Champs Camp in different places". IceNetwork.com. ^ Decool, Mélissa (October 23, 2016). "Ashley Wagner: "It was sticky but I got it done"". Golden Skate. ^ a b Brennan, Christine (April 2, 2017). "All is not lost for U.S. figure skaters at disappointing worlds". USA Today. ^ a b Zaccardi, Nick (September 20, 2017). "Ashley Wagner details dropping 'La La Land' free skate". NBC Sports. ^ "ISU GP 2017 Skate Canada International - Ladies". International Skating Union. October 28, 2017. ^ "Ashley Wagner abruptly withdraws from long program at Skate America". USA Today. November 26, 2017. ^ a b Wagner, Ashley (December 5, 2017). "Here's to the ones who dream" (Instagram). ^ "U.S. FIGURE SKATING ANNOUNCES LADIES SELECTIONS FOR WORLD, FOUR CONTINENTS AND WORLD JUNIOR TEAMS" (Press release). U.S. Figure Skating. January 6, 2018. ^ "U.S. FIGURE SKATING ANNOUNCES THREE WITHDRAWALS" (Press release). U.S. Figure Skating. January 12, 2018. ^ Wagner, Ashley [@AshWagner2010] (March 16, 2018). "In preparing to take a step back, I notified my training mate, Mariah Bell, that I was not planning on taking the alternate spot should I be called in so that she could prepare and be ready for Worlds, just in case" (Tweet) – via Twitter. ^ "Ashley Wagner – OlympicTalk". Retrieved January 24, 2019. ^ "2008 UNITED STATES FIGURE SKATING CHAMPIONSHIPS: Senior Ladies Protocol" (PDF). U.S. Figure Skating. January 18, 2008. ^ Rutherford, Lynn (November 26, 2012). "High-flying Wagner calls golden fall 'a good start'". IceNetwork. ^ Wagner, Ashley (January 11, 2013). "Gearing up for nationals". ESPN. ^ "PANDORA Jewelry Announces Partnership with U.S. Figure Skating, Four Continents Champion Ashley Wagner". PR Newswire. December 20, 2012. ^ Talarico, Brittany (October 28, 2013). "Pro Figure Skater Ashley Wagner is CoverGirl's New Face! Watch Our Behind-the-Scenes Interview". People. ^ Burton, Cinya (October 28, 2013). "Ashley Wagner Named Face of CoverGirl: Here's the Figure Skater's Olympic Beauty Plan!". E! Online. ^ a b c d e f "Ashley Wagner". Icenetwork.com. Archived from the original on September 17, 2017. ^ ISU Grand Prix of Figure Skating 2017 Skate Canada International - Gala Exhibition (Television production). Eurosport. October 29, 2017. ^ "Ashley WAGNER: 2016/2017". International Skating Union. Archived from the original on July 11, 2017. ^ a b "2017 Stars on Ice: In Dreams Tour - Music". Stars on Ice. Archived from the original on April 14, 2017. Retrieved April 15, 2017. ^ 2016 Worlds Championships [@Worlds2016] (May 2, 2015). ""...the big Ashley Wagner news of the night was (straight from her mouth) she's keeping her "Moulin Rouge" program"" (Tweet) – via Twitter. ^ Wagner, Ashley [@AshWagner2010] (July 6, 2015). "Today, we samba!💃🏻 Can't wait to get started on a sassy new short program with the wonderful @shaelynnbourne!" (Tweet) – via Twitter. ^ Brannen, Sarah S. (January 22, 2016). "The Inside Edge: Wagner plans special exhibition". IceNetwork. ^ a b "Stars on Ice Canada :: Music". Stars on Ice. Archived from the original on May 2, 2015. Retrieved May 2, 2015. ^ Tone, Florentina (October 14, 2015). "2015 Worlds: Goodbye, Shanghai!". Inside Skating. ^ Blanchard, Jamie (May 28, 2013). "Go For The Gold: Ashley Wagner". TeamUSA.org. ^ a b c Rutherford, Lynn (January 10, 2013). "Road to Omaha: Nicks confident in Wagner repeat". IceNetwork. ^ a b "Stars on Ice US - 2014 Tour Music" (PDF). Stars on Ice. Retrieved March 5, 2016. ^ Sciarrillo, Laura; D'Eredità, Eleonora (December 6, 2012). "Ashley Wagner ready for the Grand Prix Final". ArtOnIce.it. ^ a b "Stars on Ice Canada - 2013 Tour Music" (PDF). Stars on Ice. Retrieved March 5, 2016. ^ a b "Stars on Ice Canada - 2012 Tour Music" (PDF). Stars on Ice. Retrieved March 5, 2016. ^ a b "Competition Results: Ashley WAGNER". International Skating Union. ^ "2013 Japan Open detailed results". Japan Skating Federation Official Results & Data Site. October 5, 2013. Wikimedia Commons has media related to Ashley Wagner. This page was last edited on 3 April 2019, at 22:14 (UTC).